"Has all the features you could ever want and glowing reviews to match." "Has a white exterior and a stainless steel tall tub that can accommodate up to 14 place settings per load." "One of the quietest options available...and it's incredibly versatile to boot, thanks to its adjustable racks and tines." "Has a stainless steel tall tub for a spacious interior that can hold up to 14 place settings." "Includes six cycles and five extra options, including half load, sanitized, and extra dry." "Despite its reduced size, this appliance can still hold up to 10 place settings, and it operates at a super-quiet 44 dBA." "Ideal for those with hard water, as it has a built-in water softener to ensure spot clean shiny dishes." "With this model, you can simply attach a custom panel to the front, hiding the appliance in plain sight." For a Bosch dishwasher that has all the features you could ever want and glowing reviews to match, you need the 800 Series Top Control Tall Tub Pocket Handle Dishwasher. This top-control model is amazingly quiet, incredibly spacious, and surprisingly versatile, making it a worthwhile investment for your home. 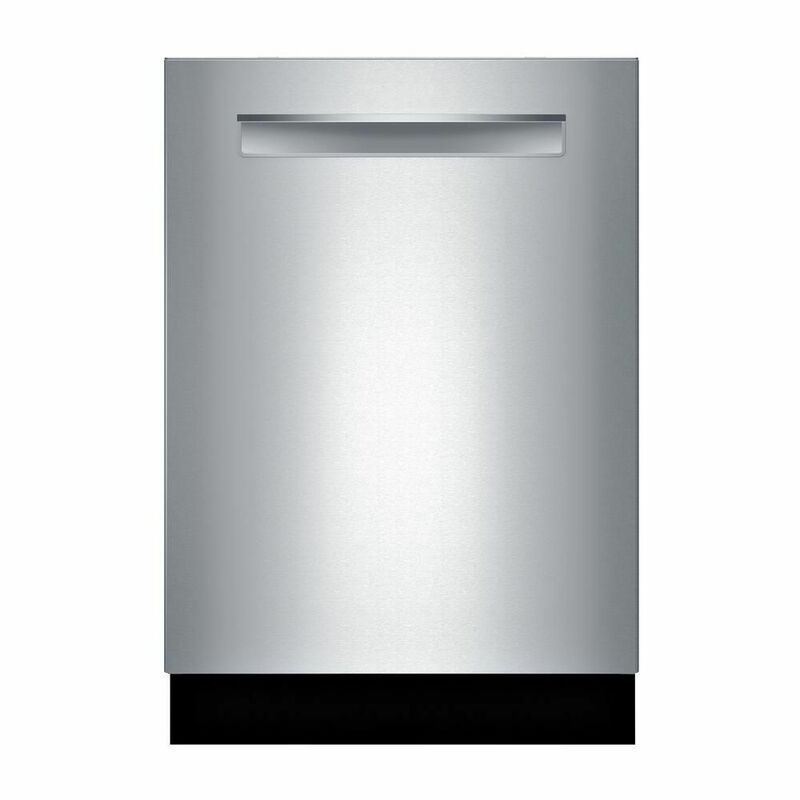 This Bosch dishwasher is 24” wide, and it has a tall tub interior made of stainless steel. The dishwasher can hold up to 16 place settings, and it boasts a flexible third rack for 30 percent more loading capacity. Further, the racks and tines are adjustable, allowing you to easily wash dishes of all shapes and sizes. In addition to its highly functional interior, this dishwasher operates at a whisper-quiet 42 dBA, and it includes six wash cycles and five extra options, including half load and sanitize. Reviewers love how quiet this dishwasher is, and many say the ability to adjust the racks is incredibly convenient when you have larger dishes to clean. Some of Bosch’s more advanced models can cost upwards of $1,000, but you don't have to shell out that much to get a high-quality dishwasher from this brand. The Bosch 24" Front Control Built-In Dishwasher with Stainless Steel Tub is a front-control, built-in model that cost less than $500, yet it still gets rave reviews from happy buyers. This 24” dishwasher has a white exterior and a stainless steel tall tub that can accommodate up to 14 place settings per load. It operates at 50 dBA, and it includes a utility rack that will help you keep awkward-shaped items safe during the cycle. Reviewers write that this dishwasher does a great job of getting everything clean, and many appreciate its quiet operation and extra utility tray. If you want the best of the best when it comes to dishwashers, you may want to splurge on the Bosch 800 24-in Stainless Steel Top Control Tall Tub Dishwasher. This high-end model from the trusted brand comes decked out with the latest features that will help you keep all your dishes sparkling clean. This built-in Bosch dishwasher is 24” wide with a stainless steel tub and controls hidden on top of the door. It comes with a MyWay rack, a super spacious third rack, as well as touch controls for quick programming. This dishwasher is one of the quietest options available, operating at just 39 dBA, and it's incredibly versatile to boot, thanks to its adjustable racks and tines. If you don't believe the hype, check out the rave reviews on this machine. People write that this dishwasher is perfect and “the best on the market.” Most notably, people love its quiet operation, versatility, and thorough cleaning abilities. The controls of a dishwasher are either located on the front of the machine or on top of the door, and there are benefits to each design. With a front-control dishwasher, you can quickly and easily program the appliance, monitoring its progress throughout the cycle. For a great front-control option, check out the Bosch Ascenta Series Front Control Tall Tub Dishwasher, an inexpensive model that delivers big results. This 24-inch built-in dishwasher has a stainless steel tall tub for a spacious interior that can hold up to 14 place settings. It operates at 50 dBA and includes six wash cycles to cater to your every need. There's a built-in utility rack for oddly shaped items, and this budget option even includes a sanitize cycle to kill bacteria. Reviewers say this machine washes and dries dishes well and operate quietly, but some people don’t like the layout of the racks. The other common dishwasher style is the top-control model, which hides its buttons on top of the door. Some homeowners prefer this style because it has a more streamlined appearance, and it's also helpful if you have young children who like to press buttons. The Bosch 800 Series Top Control Tall Tub Bar Handle Dishwasher is a wonderful top-control option if you have a larger budget. The 24” appliance can accommodate up to 16 place settings in its stainless steel tall tub interior, and it features both flexible third rack and adjustable rack positions. The dishwasher includes six cycles and five extra options, including half load, sanitized, and extra dry. Plus, reviewers can barely find anything negative to say about this model, raving about its quiet 42 dBA operation. If you live in a small apartment, you may not have room for a full-size dishwasher. Fret not, as you can still have all the convenience of a Bosch appliance with the 800 Series 18 in. Front Control Tall Tub Dishwasher. While smaller than many other models, this appliance still boasts all the features you expect from the brand. This built-in dishwasher is only 18” wide, making it ideal for small living spaces. Despite its reduced size, the appliance can still hold up to 10 place settings, and it operates at a super-quiet 44 dBA. It has front controls where you can choose between six wash cycles and five extra options, and yes, this apartment-friendly dishwasher boasts both a third rack and utility rack! According to reviewers, this dishwasher exceeds expectations both in terms of capacity and performance. Many say it's perfect for smaller households and delivers impressive results all while being incredibly quiet. Water that contains a high amount of minerals—often referred to as “hard water,” can cause problems with your dishwasher and compromise its performance. If you know your water supply has an excess of minerals, you may want to invest in a dishwasher that has a built-in water softener, such as the Bosch 300 Series Top Control Tall Tub Dishwasher. While on the more expensive end of the spectrum, this 24” built-in dishwasher is worth it to ensure your dishes always are sparkling clean. Its stainless steel tall tub can accommodate 16 place settings, and you get to choose from five wash cycles with extra options via the top-control panel. Further, the appliance is ideal for those with hard water, as it has a built-in water softener to ensure spot clean shiny dishes. People say this dishwasher’s water softener is amazing, writing that it keeps stains from forming on glasses and even removes existing stains. Plus, its performance is the caliber you’d expect from a Bosch appliance, with a quiet 44 dBA noise level. If you prefer for your dishwasher to blend in with your cabinets, you’ll need a model like the Bosch 800 Series Top Control Tall Tub Dishwasher in Custom Panel Ready. With this model, you can simply attach a custom panel to the front, hiding the appliance in plain sight! The 24” top-control dishwasher can hold 16 place settings and operates at just 42 dBA. There are six wash cycles and five extra options available, including half load, sanitize, and delicates. You’ll be able to fit all your dishes into this appliance thanks to its adjustable racks and flexible third rack, and reviewers say that it gets dishes clean even if you don’t prewash them—it’s that efficient!